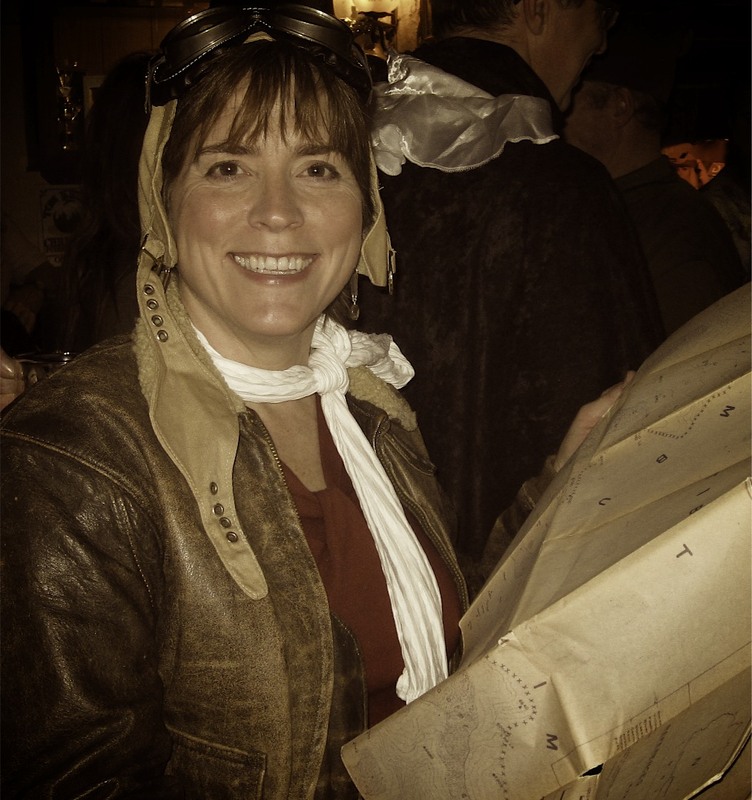 Maybe to you this picture looks like just another woman at a fancy dress/costume party … someone possibly dressed as Amelia Earhart on New Year’s Eve, but I see something different. It’s there in her eyes … joy, relief, and playfulness … the kind of things one might feel when finally arriving at their destination after a long journey. Too many of us get stuck in the past never letting go of old hurts or regrets. I have long been determined that I would not be a casualty of what I could not change and when I couldn’t find my own way, I had enough sense to ask others for a bit of help and direction. I know I walk a clearer path today because of the guidance and support of two very special women. I am sure they both know how important the work is that they do, but I want to say thank you again to Nancy and to Wendy for helping this traveler find her way home. So often I see an internal struggle in the words of the writers whose blogs I read. It is difficult not to want to lend directional support when I see people in crisis. It’s my nature to be a caregiver although I didn’t believe it for many years. I remember exactly, the moment I realized what I had been doing and the impact on my life. It was the beginning, and I do mean the beginning, of real and lasting change for me. While I earnestly believe as J.R.R.Tolkien said, ” Not all those who wander are lost ” I also understand that it can be a long and lonely road for those who grow weary of constant movement. If you’re struggling to do it all on your own, I hope this will be the year you find your own “Nancy or Wendy ” to help you on your way back to whatever you call home. This entry was posted in Bloggers, Choices, Health & Wellness, Life in General, Unexplainable and tagged Directional Support, Gifts Of The Journey, Healing, J.R.R. Tolkien, Nancy Loeb, Wendy Palmer Patterson. Bookmark the permalink. I love this post…my husband is going through his own internal struggle and this is so on spot…I’m going to share it with him! thank you for making this post. Great idea for the fancy dress! Came here by way of PW. And had to check out who you were. Especially after you saying that you were so glad not to be in the pharmaceutical biz anymore. My husband is a chiropractor and I won’t go into how peeved we both get at big bucks drug companies. So glad you’re out. Deb – Thanks for sharing about your husband and I hope he can find a “Nancy or Wendy” of his own to chat with. There is nothing like having someone else help you gain a little clarity. It can be too easy to get stuck in the hamster wheels in our heads if we don’t. Mariellen – I have been loving your comments on other posts and please know how much I appreciate what ever you have to say. I don’t always get back to respond, but I always like seeing someone connect with something I’ve written. Thanks too for your comment on our costume choices. Rebekah – Thanks for stopping by and letting me know you were here. I’m so glad I’m not working in pharma either. I did enjoy working in HIV, I made some great friends during that time, and we did good work, but the industry went through major changes and I just burnt out. Thanks for letting me know about Joyce…I’ll have to check her out.